A Historic Sausalito Manor Dedicated to the Support of Local Charities. 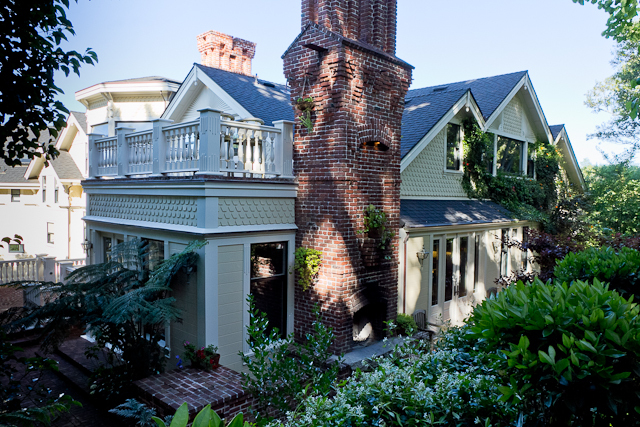 This historic home in Sausalito, CA serves as a private residence and dedicated event space for charity only. Recently awarded special recognition by the California Heritage Council for its restoration and preservation, The Pines is one of the town’s oldest and unique houses. It’s 4 floors of exceptional architecture contains a fully equipped professional kitchen, a formal dining room that seats twelve, a lower level with a complete bar, dedicated port room, stage and dance floor; and several outdoor areas for use as additional dining or bar areas, a lounge or a fire pit. It offers sweeping views of San Francisco and beyond. Please contact us regarding availability for deserving charitable events. This Queen Anne style residence was built and completed in 1888 by Major O. C. Miller. Major Miller, his wife and four children resided in the house which was simply called “The Pines” as there were no street names at the time. Major Miller died here peacefully in 1903. Major Orson C. Miller one of the most prominent residents of Sausalito. He fought at Gettysburg in the Civil War (Union Army), was employed in the US Custom House, was Secretary of the Mint at San Francisco and later founded the Sausalito Bay Land Company that developed the southern part of Sausalito known today as Old Town and connected it to New Sausalito by building Sausalito Boulevard. Having served as one of the four Town Trustees, and instrumental in establishing the first electric company, fire department and school house, he was considered a “City Father” of Sausalito.